This describes little Joe's first crop, with the help of his mother. Little Joe and his mother finished planting radishes. Joe watered them all by himself so, as his mother explained, "they would sprout and grow and become radishes." After the watering, the 4-year-old Amish boy stood there watching the dirt. "What are you looking for, Joe?" his mother asked him. "I'm waiting for the radish to sprout and grow, Mommy." "It will take a long time, son," she said. "They must decide to become plants and then grow out of the ground. Go play and look again next week." 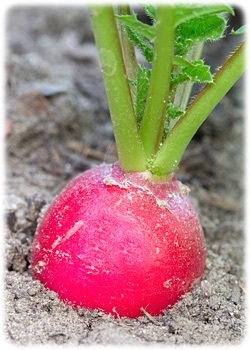 The day the radishes started to poke up out of the ground, Joe's mother told him, "Those are your radish plants. You may take care of them so they grow into nice radishes." That day, Joe did more laughing and smiling and running around than he had all the previous week. The world smelled good and the sun felt warm. Every three days, except Sundays, Joe proudly hoed his row of radishes — the weeds, not the radishes. But it wasn't easy. The hoe would try to hoe where it wanted rather than where Joe wanted. Sometimes the hoe would hoe a radish by mistake. His mother lovingly suggested, "Use your fingers to pull the weeds near the radish plants. Then hoe the weeds that are further away." "It will be easier if you hoe a little slower," she continued. "And stop pulling if the hoe goes where you don't want it to go." The weeks progressed. His mother showed Joe how to gently push soil away from the side of the root to see how big the radish was. His mom had told him, "When it's as big as two of your thumbs put side by side, then it's big enough to harvest." Those were the best radishes Joe ever ate, then or since. They were his first crop. His mother said so. Use this form to send a private note to Will Bontrager, the author of Little Joe's First Crop.